The chart shows that students increasingly contact Career Services the longer they stay at Bridgewater College. First and second year students contact Career Services at low rates, maybe because of a lack of awareness about Career Services’ opportunities. The data show that internship search and resume/cover letter assistance are the two services that students use the most at Bridgewater College. Because these two are used so extensively, we focused our project on these two services. There is a profound difference in both the presentation and the availability of information between the career services’ websites of Bridgewater College and other colleges and universities such as EMU, JMU, and Virginia Tech. Bridgewater’s website is not very user-friendly. Although its organization is neat and clear, most of the information is given through links to other websites. The BC website is not a “one-stop shop” like the other schools’ are. A student using the BC website would almost be better off googling the question he has as this would produce nearly the same results. The information that is given directly on the BC website tends to be very general, slightly vague, and not very helpful as there are no concrete visual examples. For instance, there are no examples of good resumes, cover letters, etc. on the BC website—only links to other websites that may or may not provide examples. In terms of internships, the Bridgewater College Career Services website provides very little practical information. The webpage on internships provides just five basic benefits that internships can provide. Then it directs students to the MyBC website, their academic advisor or faculty sponsor, or Career services in order to find an internship. Providing a database of available internships directly on the website would provide students with the available information to begin their internship search on their own. Other schools’ websites also provide a calendar of upcoming career services events. This calendar is usually embedded directly on the home page. BC Career Services, however, does not provide a calendar at all. Having a calendar would dramatically increase the usefulness of the site, as students would be able to plan more effectively to attend upcoming career services events. After contacting other schools, we learned that some of their biggest areas of service to students are internship/job search and resume/cover letter reviews. While the BC website may provide links to some helpful materials for these topics, more could be integrated directly into the website itself. Additionally, the BC Career Services website provides almost zero information on why certain things should or should not be emphasized on a student’s resume. A total of 216 BC students have taken our survey. 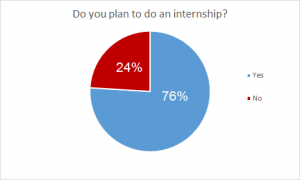 Only 29% of respondents said they have had an internship experience since starting at Bridgewater College. Out of the 71% of respondents who said they had not yet had an internship experience, 76% said that they planned on doing one. The #1 reason for not doing an internship was that the student needed money for school, and the internship did not pay. 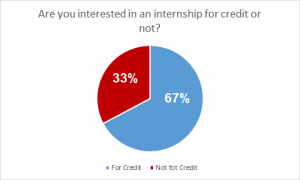 The data shows that more students are interested in an internship for credit rather than an internship that does not provide class credit. 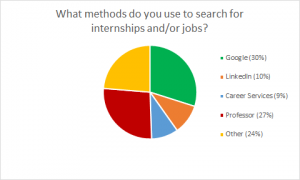 Of the respondents who had searched for internships or jobs, only 9% used Career Services to do so. Of the respondents who had completed an internship, only 21% used Career Services to coordinate their internship. 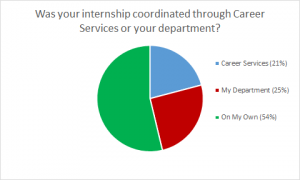 Clearly, there is a disconnect between the number of students who plan to do internships and the number of students who actually complete one. Part of the problem seems to be an inability to find paid internships and an under-utilization of Career Services’ resources. Our project addresses this problem by making Career Services’ resources easier to use and paid internships easier to find. The team has been focused on finding the elements that will make the project sustainable. First, in regard to our website, we created a program that combs through all of the links in our internship to check whether or not the links work. If a link does not work, the program will remove the item from the internship list. Second, Career Services has an intern whom the Director of Career Services, Sherry Talbott, said would make advertising for and upkeep of our website a priority. Third, two of our team members will be on the Bridgewater campus next year, and they can be reached for assistance if needed.